Take a tour through the horror paperback novels of two iconic decades...if you dare. Hear shocking plot summaries that invoke devil worship, satanic children, and haunted real estate! 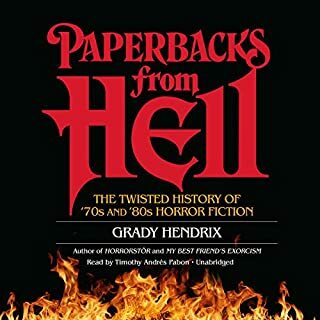 Horror author and vintage paperback book collector Grady Hendrix offers killer commentary and witty insight on these trashy thrillers that tried so hard to be the next Exorcist or Rosemary's Baby. Complete with story summaries and artist and author profiles, this unforgettable volume dishes on familiar authors like V. C. Andrews and R. L. Stine, plus many more. Something strange is happening at the Orsk furniture superstore in Cleveland. Every morning, employees arrive to find broken Kjerring wardrobes, shattered Brooka glassware, and vandalized Liripip sofa beds - clearly someone, or something, is up to no good. To unravel the mystery, five young employees volunteer for a long dusk-till-dawn shift and encounter horrors that defy imagination. 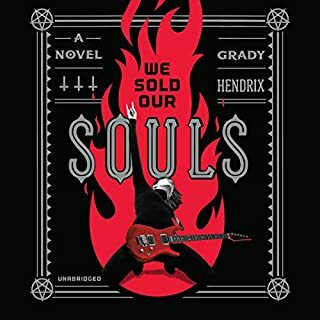 Along the way, author Grady Hendrix infuses sly social commentary on the nature of work in the new 21st-century economy. Does anyone else out there have an aversion to IKEA? Like, someone suggests we pop over there real quick, maybe bribes you with coffee and cinnamon rolls, and then BAM. The whole Saturday has mysteriously disappeared? Wait, what just happened to me this past weekend? Horrorstör is one part Office Space, and one part haunted house story. Thankfully, the haunted house in Horrorstör is essentially an IKEA. I’m thoroughly enjoying Grady Hendrix’s Great Stephen King reread over at Tor.com (please note the presence tense, and my faith it’ll one day continue), and thought his White Street Society short stories exquisite dark humor, so when I heard he had a novel set in a Haunted IKEA (or, more accurately: ORSK, an IKEA competitor), I knew I had to check it out. I’ve been to IKEA way more times than I’d like, and while I don’t have the Chuck Palahniuk/Fight Club aversion to it that some do, it does feel a bit like a gauntlet at times — winding around those labyrinthine aisles. Hendrix does a solid job of bringing us in from the street level with Amy, a young woman just barely getting by, and coming to the horrific realization that she really has no plan on where her life is going. But there’s been a lot of weirdness happening at ORSK, and when Amy’s offered a late night shift by her boss Basil along with three other employees, she really can’t turn it down. Things go downhill fast from there, in something of a creepy yet kind of hysterical way. There’s a nasty little seance scene that felt like something straight out of a Sam Raimi film, and I couldn’t stop laughing while listening to it. 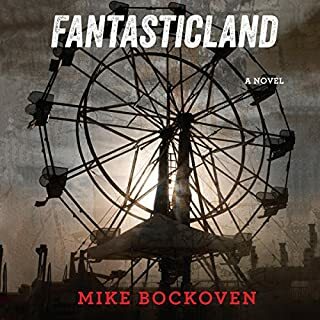 But about two-thirds through the book, the story less somewhat less funny and more straight-up horror, and my interest waned a bit, and the ending seemed a bit sudden. Still, Hendrix does a good job with next-door characters that seem like they could’ve walked out of a Stephen King novel. Amy is easy for just about anyone who has been hard up for cash to relate to, but Basil — the African American store manager whose name evokes Basil Rathbone and who is evangelical about all the corporate propaganda — is particularly strong. Hendrix knows his horror tropes, and does a good job subverting them. 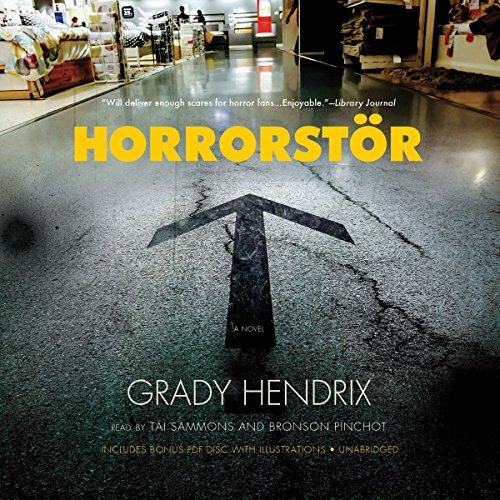 Tai Sammons does the heavy lifting narration-wise in Horrorstör. She’s got a solid, no frills everywoman narration that nails the protagonist pretty well, and gets by okay with the rest of the cast. Bronson Pinchot is essentially reading the chapter headers, and you can tell he’s having a blast. Together, they’re a winning combination. I could be convinced to head back to Horrorstör one day, mostly for the first half and the solid narration. It left me a little cold in places, but generally I imagine I’ll have a lot more fun whenever I go back to IKEA thanks to Hendrix’s book. Also, the coffee and cinnamon rolls. This book was fantastic. I was never bored, always engaged. The scary scenes were real good. The story was fun. The characters were great, basil was my favorite. I highly recommend this book to anyone that's looking for a fun horror novel. Just sit back relax and enjoy the ride. Unique story with some insightful moments. It's playful, funny, and scary! It's read wonderfully, and put together well for an audiobook experience. Not as scary as it thinks it is. I really, really wanted to like this book. A great premise which floundered in its execution. It tries it's best, but it never gets beyond the initial elevator pitch of a haunted IKEA. It has some neat ideas that I wish we'd explored more. 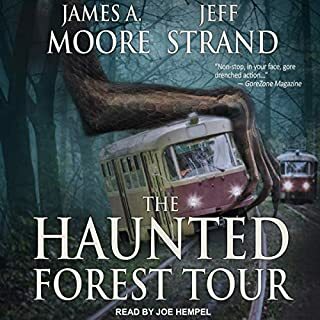 This book would be great if it were double the length and it gave itself time to dig into the characters, the setting, the store and the haunted stuff. This feels too rushed. Despite the fact that this book ended up being completely ridiculous - just like so many of its horror movie counterparts - I still liked it. The creative use of the Orsk advertisements throughout the book and the use of the Orsk Handbook to guide Basil in his by-the-book approach to management - even when faced with evil apparitions attempting to kill him and his staff - added humor to the story and made it clear that the author wasn't taking this horror story too seriously. So, yes it was ridiculous, but possibly it was meant to be. I would have loved this back in the day. Although nothing spectacular, it's a pretty good horrorstöry with believable characters and a modern twist. I loved this audiobook. the narrator did a fantastic job covering multiple characters, the story was interesting, engaging, and just the right amount of creepy. 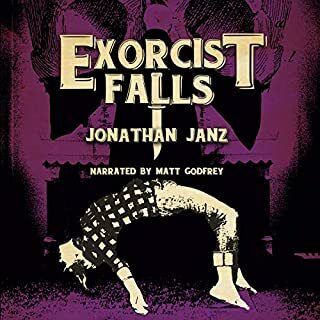 I started this audiobook at around midnight and got so into it, I stayed up well into the 6am hour because I just couldn't bring myself to stop, I had to know what happened next. I am a big fan of sleep, so to forgo it in favor of just about anything is high praise! Interesting plot, relatable characters, and fun. Also makes you think. I really like this author. It took until the 3 hour mark of this 6+ hour book to reach the beginning of what I believed to be one of the spookiest stories I've heard/read. If you've decided to read this spoiler before purchasing, don't let the timestamp sway you. It's supposed to be a parody before it flips a 180 and turns into a horror novel. The concept of a haunted "Ikea" was great (especially since I grew up near the haunted Toys R Us". Tai Sammons did a great job and Bronson Pinchot's chapter introductions was wonderfully cheeky! As I mostly listen in the car, I didn't see the PDFs until after I was done with the book...they definitely add comedy horror to the book!! My only delta was the "to be continued" ending. I got expecting a ok story set in retail and was left pleasantly surprised. Loved the setting and the main character though the story itself was sort of a mix of Hellraiser and Silent hill. But what really popped for me was the little item descriptions for things in the store that punctuate each chapter. The other reader and the fact that as the story grew darker these description mirrored them was a refreshing change from the norm. If you like horror fiction I would suggest this is a good book to add to your collection. 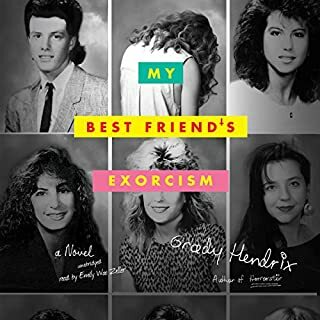 Grady Hendrix manages to toe the line between satire and horror in this workplace-comedy-turned-nightmare. Clever and well paced, the novel takes the everyday horror of retail work and introduces real balls-to-walls horror. Unafraid of brutalizing his characters, Hendrix follows the journey of Amy- your run of the mill adult, stuck in a rut. While her character's journey was satisfying to hear, and her growth empowering, at times the narration fell a little flat. Tai Sammons perfectly captures the deadpan tone the satire needs, but sometimes the monotone made the last sentences of chapters seem unfinished.